In 1887, Raleigh philanthropist Richard Stanhope Pullen donated 80 acres of land to the city for use as a public park. Pullen Park has since become an important component of Raleigh civic life, providing citizens with a variety of recreational opportunities. Its star attraction, however, is its carousel. Tradition maintains the carousel made its Raleigh debut at Bloomsbury Park, an amusement park developed in 1912 by the Carolina Power and Light Company (CP&L). The park was situated in a wooded glen at the end of CP&L’s streetcar line, just beyond then-new suburban neighborhoods. In answer to Bloomsbury’s success, the city improved Pullen Park, and, about 1915, purchased the Bloomsbury carousel. Bloomsbury Park closed after World War I, and in the mid-20th century its wooded grounds were subdivided into residential lots. The carousel quickly became a Pullen Park focal point. Today, it is recognized as one of the foremost surviving works of the Pennsylvania Carousel Company, founded by Gustav A. Dentzel. Dentzel emigrated from Germany in 1860 and set up a cabinet making shop in Philadelphia. Public enthusiasm for a small merry-go-round led him to full-time carousel construction in 1876. From then until the closing of the factory in 1928, Dentzel’s firm was the premier maker of carousels in the United States. 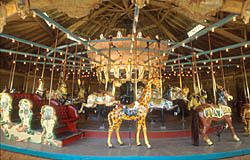 The Pullen Park carousel dates from about 1900, making it one the earliest Dentzels still in operation. Its paramount feature is a menagerie of 52 hand-carved wooden animals, the work of chief carver Salvatore Cernigliaro. 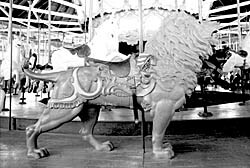 Cernigliaro was known for elaborately executed and imaginative designs; in addition to 30 horses, the Pullen Park carousel includes ostriches, cats, rabbits, pigs, a lion, a tiger and a goat. The 24-foot diameter carousel is housed in a permanent wooden-beamed shelter of tent-like design. Music originally was produced by a Wurlitzer band organ. The carousel has been in use almost continuously since coming to Raleigh. Although wear has forced the replacement of several mechanical components, the ride remains largely intact. In the late 1970s, the city undertook a major renovation of the carousel animals, replacing broken parts and returning the creatures to brilliant coloration. Park visitors today can enjoy much the same ride their great-grandparents did. The Pullen Park Carousel is a designated Raleigh Historic Landmark. The Pullen Park Carousel, located near the Ashe Ave. entrance to Pullen Park, is operated during warmer months. There is a small fee to ride the carousel. Call 919-831-6468 or visit the park’s website for further information.